Much like the Riverhounds opponent the previous week, Wilmington, the Baby Reds had been struggling to score goals, but have shown decent form during a run of home games. They scored twice against the hottest team in the league, Louisville City FC last week, and the week before they knocked off a strong Charleston team, 1-0. They are one of the teams in USL that does not have as many goals as Pittsburgh’s Rob Vincent (16), as they have a total of 13 for the season. One bright spot has been Quillan Roberts, who has been strong in net, leading USL in save percentage and saves per game. This will be the third and final meeting between the two teams. Pittsburgh has rolled to two victories. 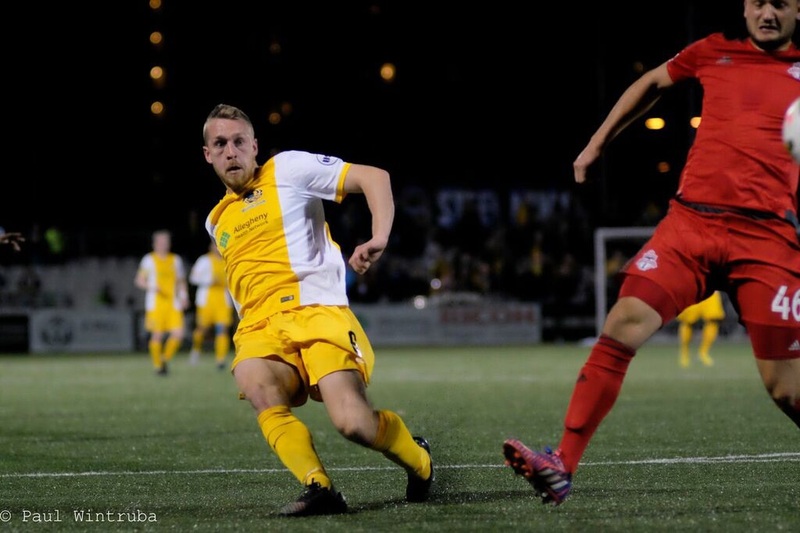 In April, the Riverhounds broke open a tight contest, by taking advantage of a 10-man Toronto squad in the second half to a 5-1 win. Then in early July, in the first ever match at newly refurbished Ontario Soccer Centre, the Hounds got an early goal from Kevin Kerr and a late tally in stoppage time from Anthony Arena that sealed a 2-0 win. Pittsburgh Riverhounds return to Toronto this weekend looking to reinforce their position in the USL’s Eastern Conference playoff zone. Another win Saturday night could lift the Hounds to within touching distance of the fourth-placed Richmond Kickers or build a cushion over the chasing Harrisburg City Islanders depending on the result of Saturday’s clash between those two sides. The Hounds appear to be in good spirits after getting back on track against the Wilmington Hammerheads last week. Rob Vincent earned USL “Player of the Week” honors for the second time this year after netting all three goals in the 3-0 win. Vincent’s hat trick pulled him level with Oklahoma City Energy forward Danni Konig at the top of the USL scoring chart with 16 goals. Vincent leads the league outright in goals-per-game, points and points-per-game. Kerr is the league’s joint leader in assists with eight. The Scottish midfielder ranks fifth in points with eight goals added to his assists tally. The Riverhounds continue to lead USL in goals scored with 42 in 20 games. Hounds head coach Mark Steffens will again be without Jamaican national team goalkeeper Ryan Thompson as he rests an inflamed knee. Drew Russell and Vini Dantas remain sidelined with respective knee and heel problems while Orlando City has retained the services of Conor Donovan. The United States Under-20 national team defender is expected to resume his loan spell in Pittsburgh after this weekend’s action. The young Toronto squad is playing decent soccer right now. They have found some confidence after 1-0 win over Charleston and taking Louisville FC to the limit last Saturday. I remember noting that after watching them play the first time around at Highmark Stadium in April, that Toronto FC II was a team with a lot of speed, athleticism — raw technical ability — but they were still lacking composure and discipline. The Hounds needed a late goal to put them away in their previous meeting in early July. The Baby Reds feature a roster with mostly young Canadian born players who are taking advantage of getting extended playing time in the USL. Once again, without Ryan Thompson in goal, the Hounds will continue to rely on Calle Brown. Brown has had four clean sheets already this year, and came up with some big saves last week for the shutout against Wilmington. Toronto’s athletic defenders and midfielders seemed to do a decent job of limiting USL goal scoring leader Vincent in their last match, and look for more of the same. This should open up things again for Kerr and other attackers to try to unlock the Baby Red defensive alignment. The Hounds must be wary of their last trip to Canada, and a poor performance against a Montreal team that was low in the standings but in good form at the time. Toronto is playing well, and this will be a test for a Riverhounds team that needs to improve on a 2-6-1 mark on the road if they want stay in the drivers seat for playoff positioning.